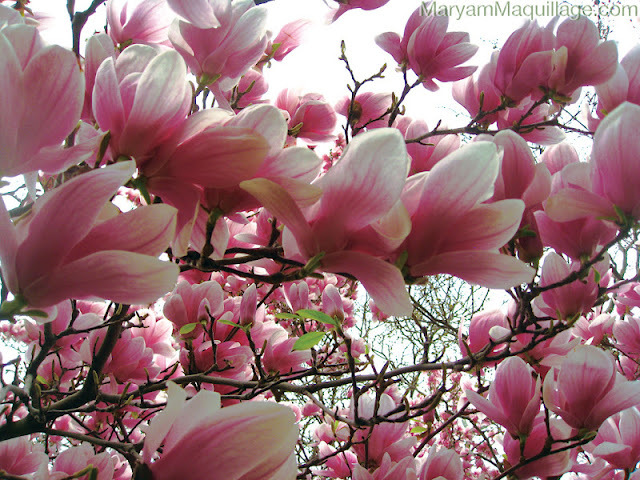 Just look at those juicy petals, isn't she a beauty, this tree? Anyone knows her name? 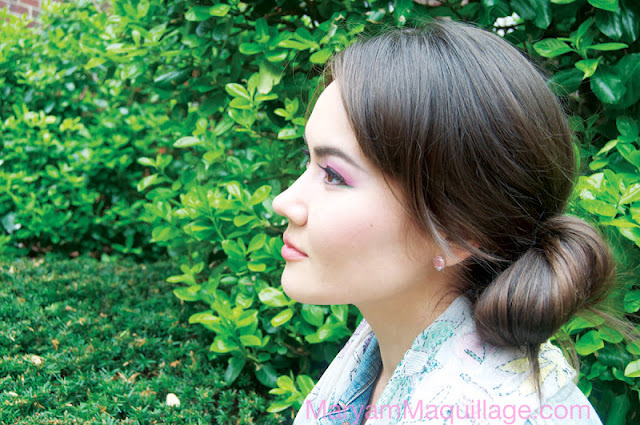 The Look: Secret Garden meets Chinese Calendar Girl :)) The skin is pale, but dewy; the makeup is soft, but vibrant; the hair is traditional, but asymmetrical. This look is ready-to-wear and versatile: dress is down with jeans & t-shirt for a pretty, casual daytime ensemble or play it up paired with your favorite little black dress for an unexpectedly fresh "Japonesque" evening look. NYX Eyeshadow Base in White -- applied and blended using a concealer brush. I love using this primer under Coastal Scents eye shadows to help them adhere easily. Darkness false lashes in K-ma 6 -- Darkness lashes are especially made to fit Asian eyes. The bands are much flatter and stiffer than regular false lashes, which works really well with almond eyes. HAIR: To get this easy side bun hair style, I simply brushed my hair to the side and secured it in a low ponytail using a large clip. Next, I gathered my hair and twisted it loosely around the clip to give it some body. I pinned the ends under the bun using bobby pins and pulled out some strands from the center of the bun to disguise the clip. P. S. The MakeupBee competition has been extended! Get your look in before March 31 and don't forget to tell 'em who sent ya!!! awww this is perfect you look like a Chinese Goddess stunning dear!! 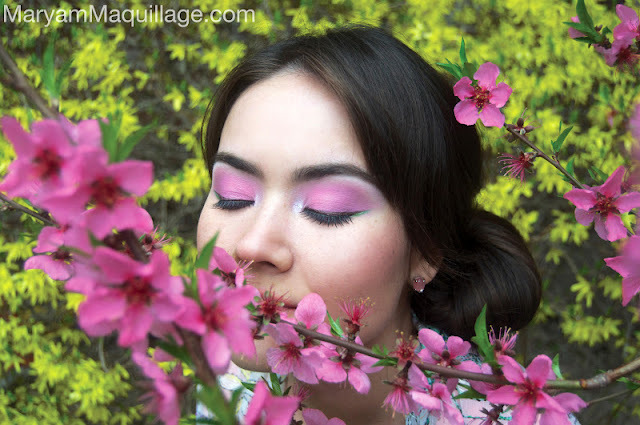 Great photos with the Flowers and translating it with your makeup. Seeing all the flowers bloom sure lifts up my spirit. Gorgeous as always! such a preaty look and i love the hint of green. love the make-up. :) You're gorgeous. Please follow back. So gorgeous! 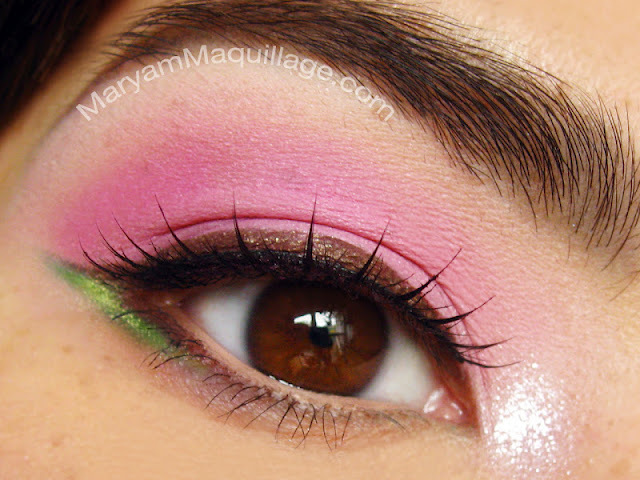 I love the little flash of green, and the added detail of using brown as the liner, like a tree branch! Aww Maryam this is gorgeous! & the flowers are so beautiful! everything about these are gorgeous!! These pictures look like something out of a MAGAZINE and honey, I am buying whatever you're selling. The inspiration is so subtle but so clear and what a beautiful look, honestly. This is so girly and romantic and evocative of everything wonderful about spring. I wish I could vote more for your Makeupbee look. Keeping my fingers (and toes) crossed for ya. You could pull off any ethncity, so stunning! I simply adore how cute, girly, and springy it is! Wow! You're fabulous!!! I lOVE IT! All the post :o). Have a nice day. Xoxo V.V. you look so "fresh" ... i like that look a lot! makes me want to pinch those cheeks! oh dear you're so beautiful!!! i just wish i can see those beautiful cherry blossoms as well!!! thank you so much darling :)) the trees are all in bloom here, it's so uplifting to see!! and yes, I'll teach you anytime!! What great inspiration! 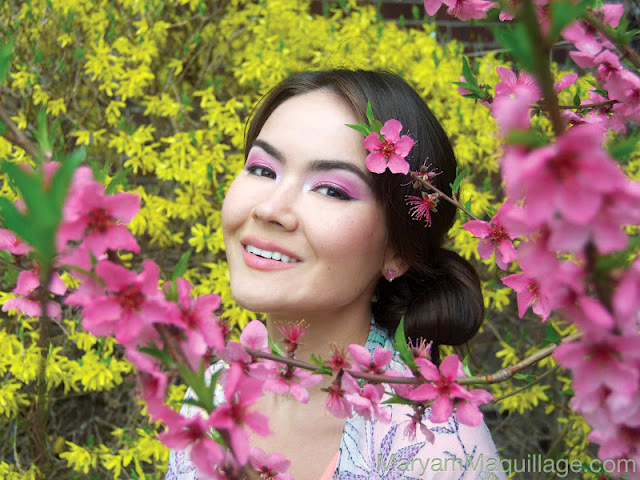 The cheery blossoms are beautiful and you really captured that in your latest look. Love! This makeup look is so beautiful! You look so beautiful! Hi Maryam! How are you? Super post! I published a post about you. You should read and see the photos. I am sure that you will like it! Thank you..
beautiful love this flovers ...i think its magnolia isnt it? yes, I think you might be right!! I love the 5th picture! thanks Sue :)) lol it almost didn't make the cut!! So kawaii! So cute! Looks like a fun look to do! Wow I wish my color palettes were this pigmented and lovely. Beautiful look! You look glorious. NYX sticky base or jumbo eye pencils :)) they make everything so much better and brighter!! 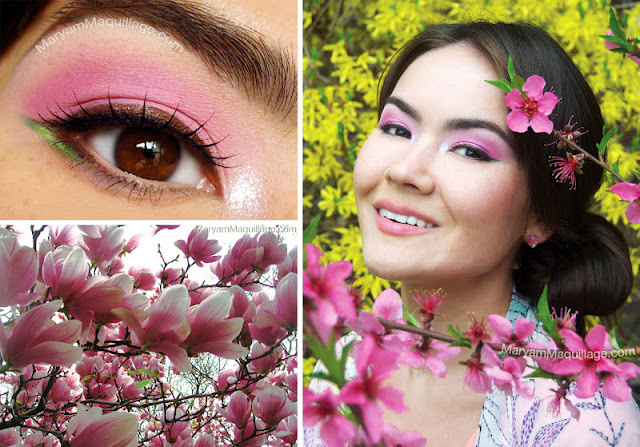 I instantly thought of cherry blossoms when I saw your make-up so you did a great job. That green colour is just lovely! This is so pretty! I love the tiny bit of green with the pink. 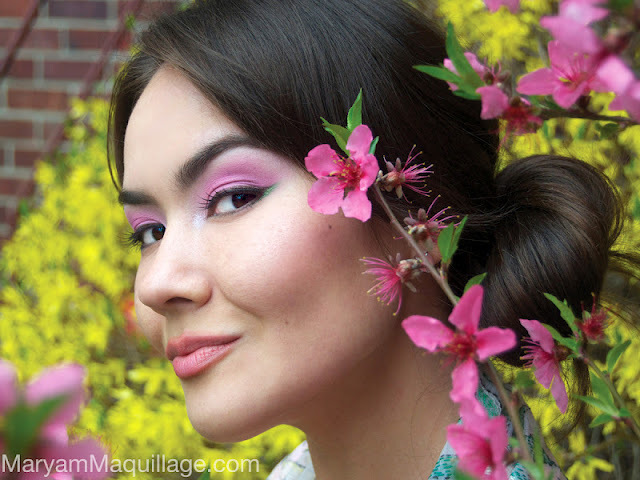 A perfect springtime look! Lo and behold you have transformed into a Chinese fairy princess !